Fundraiser Julie Farrell (second left) with daughter Carla, landlady Julie Kilmore, helper Julie Yates, and fundraising manager Jamie Davenport. A Louth woman has said a big ‘thank you’ to the community for helping to raise £800 for Macmillan Cancer Support. Julie Farrell organised for the Birmingham ‘Peaky Blinders’ to visit Louth as part of her fundraising event on August 25, meeting members of the public and raising vital funds. A big raffle also took place at the Pack Horse pub on the day, with a £50 Vaping Worx voucher as third prize, a ‘Peaky Blinders’ suit as second prize, and a fantastic £600 worth of paintball vouchers donated by Bawtry Paintball Fields at the top prize. She added that she would like to say a huge thank you to all the businesses and individuals who got involved and donated prizes. Special thanks goes to Julie Kilmore (landlady at the Pack Horse) for hosting the event, and all her customers who donated. The funds raised through the raffle and the Peaky Blinders visit were added to the money raised by Julie’s daughter Carla (14), who took part in a sponsored head shave alongside her friend Emily Ackroyd (14) back in July. 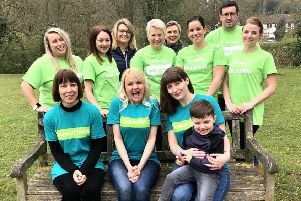 Jamie Davenport, fundraising manager at Macmillan Cancer Support, said: “I’d like to thank Julie and everyone else involved for all their hard work. A coffee morning to raise further funds for Macmillan will take place at the Pack Horse, in Eastgate, on Friday September 28 from 10am.